52 exercises and practices to help kids calm their mind and body, pay attention, become more self-aware, feel happier and confident, connect with others and have fun. 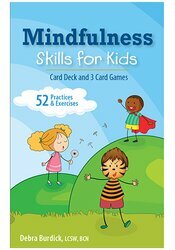 Deck can also be used as card games (based on popular children's games) that encourage kids to practice a mindfulness skill each time they win a hand. Great for therapists, teachers and parents. Perfect for ages 4 and up. Debra Burdick, LCSWR, BCN, is an international expert on mindfulness and ADHD, a bestselling, award winning author, licensed clinical social worker and board certified neurofeedback practitioner. She is a pioneer in using mindfulness skills to improve mental health, teaching professionals and clients how to successfully integrate these practices into their lives and work. For resources, books and mindfulness skills, visit TheBrainLady.com.